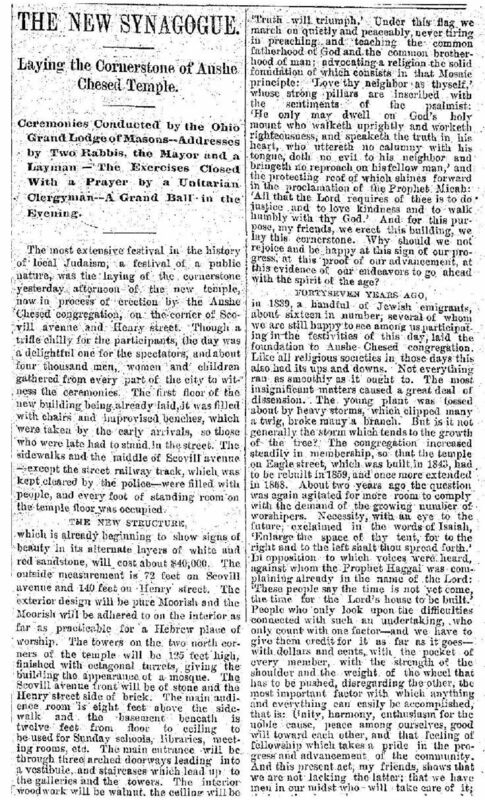 On the afternoon of Thursday, October 21, 1886, a huge crowd gathered at the corner of Scovill Avenue and Henry (East 25th) Street for the laying of the cornerstone of the second home of Anshe Chesed, Cleveland's oldest Jewish congregation. 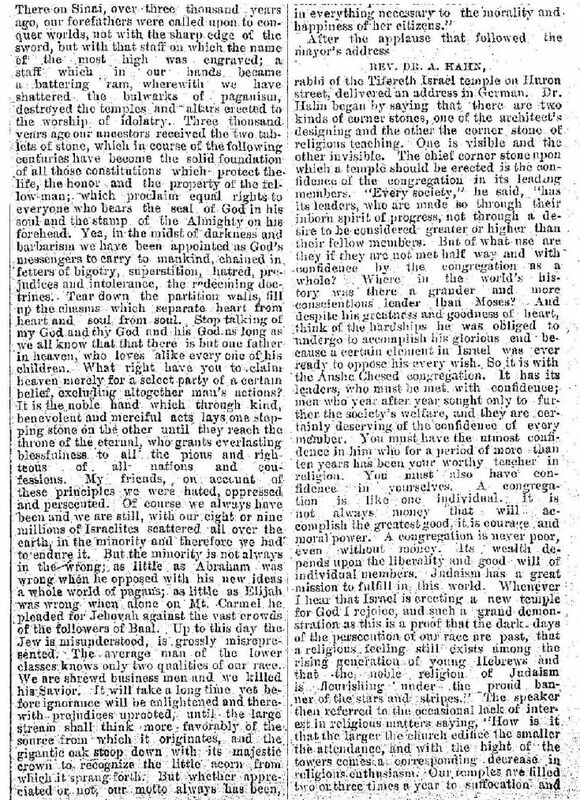 We are fortunate that the editor of the Cleveland Plain Dealer was willing to devote nearly half a page of an eight-page issue to the story, and that the shorthand skills of the unnamed reporter could capture long speeches - two of them in German - to give us a rich picture of an event that took place nearly 130 years ago. 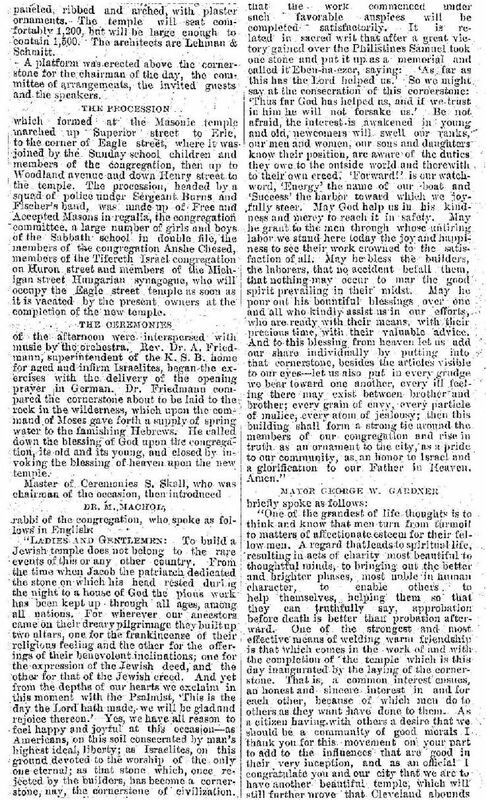 Anshe Chesed Congregation would occupy its new building on Scovill Avenue just before the High Holy Days in 1887, less than a year after the cornerstone-laying ceremony described above. Cleveland was growing at an accelerating rate. The stream of immigrants from Southern and Eastern Europe that had begun after the Civil War became a great wave. Population more than doubled between 1890 and 1910: from 261,000 to 560,000. Immigrants moved into the old neighborhoods downtown and some to the near west side. More established families moved to newer neighborhoods away from downtown. Some went west of the Cuyahoga River, some south. Most who were east of the river kept moving east. They would keep moving east to newer housing, often following the streetcar lines. We find them living with non-Jewish neighbors north and south of Euclid Avenue: by 1880 at East 55th, by 1910 almost at University Circle. Less than 25 years later, its membership quadrupled, Anshe Chesed, now led by American-born Rabbi Louis Wolsey, would move in March 1912 to Euclid Avenue and East 82nd Street and become known as the Euclid Avenue Temple. 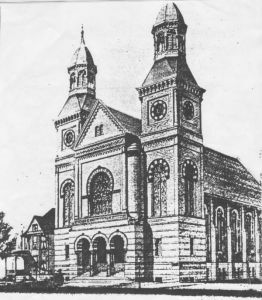 In December 1913 the old synagogue building was sold to bakery owner Jacob Makoff, its towers removed, and converted to a movie theater. Scovill Avenue has become Community College Avenue and the land is now part of Cuyahoga Community College. What happened to the time capsule from 1886 that was in the Scovill Avenue cornerstone? The copper box was moved to the cornerstone of the Euclid Avenue Temple. Is it still there? As our rabbis say, that is a good question.